Mylor is situated approximately five miles north of Falmouth. It’s a short drive to the town but why drive when you can take a water taxi from Mylor Yacht Harbour? 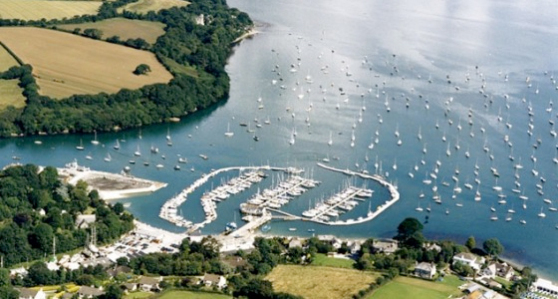 Mylor lies within the Cornwall ‘Area of Outstanding Natural Beauty’. Almost a third of Cornwall has AONB designation, with the same status and protection as a National Park. The large house on the bottom right corner of the photo above is Penarrow House. This 5 bedroom holiday home sleeps up to 10 people and offers outstanding views, nothing beats relaxing on the front patio watching the various boats sail past you. Castaways Wine Bar is just minutes away on foot in Mylor Harbour, with Mylor Seafood Restaurant next door offering fine dining and is a great choice for special occasions (and a short walk home). The famous Pandora Inn is a short 2 mile drive, located on the waterside jsut the other side of Mylor Bridge. For those wishing to stretch their legs, Flushing is a scenic 45 minute walk away, with a choice of pubs in the village for a well deserved Cornish ale.